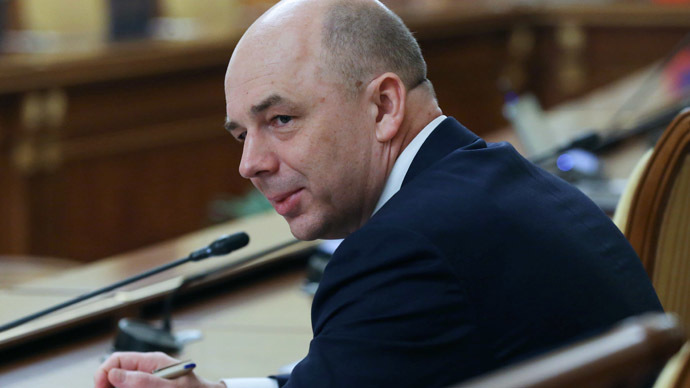 The Russian economy has begun to stabilize, climbing from its lowest point, according to Finance Minister Anton Siluanov. He says the ruble is becoming a stronger currency as it has sustainably grown since the beginning of 2015. "The negative peak has already passed and we are observing certain moments of stabilization," Siluanov said at a meeting of the Russian Union of Industrialists and Entrepreneurs Thursday. The financial sector is also improving gradually, showing positive dynamics, he said. "The situation in the financial sector is also stabilizing, we see an increase in yield on debt instruments, and that the financial market is growing," said Siluanov. Talking about the outlook for inflation in 2015 he said it may be lower than the official forecast of 12.2 percent, adding that he expected price growth to soothe to 6-7 percent by the end of 2016. The Russian Finance Minister expects GDP to fall by three percent this year as investment demand is the only possible source for recovery. The government has no plans to increase taxes and tighten the screws on business, he said. The Minister of Economic Development Aleksey Ulyukayev added that the moratorium should cover not only tax issues but ‘quasi-tax’ expenses. The minister also said it is ready to delay the capital amnesty deadline for Russian companies reporting their offshore subsidiaries. “We are really cooperating with the MPs, we are ready to move the term for reporting about controlled foreign companies from April 1 to the fall, maybe to October 1,”he said. The amnesty law was first proposed by President Putin in December 2014 and is expected to be signed during the spring parliamentary session.